Rolls-Royce and global towage operator Svitzer have successfully demonstrated the world’s first remotely operated commercial vessel in Copenhagen harbour, Denmark. Earlier this year, one of Svitzer’s tugs, the 28-metre long Svitzer Hermod, safely conducted a number of remotely controlled manoeuvres. From the quay side in Copenhagen harbour the vessel’s captain, stationed at the vessel’s remote base at Svitzer headquarters, berthed the vessel alongside the quay, undocked, turned 3600, and piloted it to the Svitzer HQ, before docking again. The companies have also signed an agreement to continue their cooperation to test remote and autonomous operations for vessels. The primary systems involved will be autonomous navigation, situational awareness, remote control centre and communication. The Svitzer Hermod, a Robert Allan ship design, was built in Turkey at the Sanmar yard in 2016. It is equipped with a Rolls-Royce Dynamic Positioning System, which is the key link to the remote controlled system. The vessel is also equipped with a pair of MTU 16V4000 M63 diesel engines from Rolls-Royce, each rated 2000 kW at 1800 rpm. 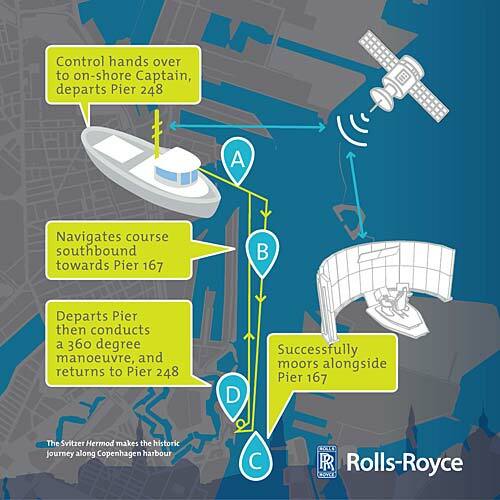 The vessel also features a range of sensors which combine different data inputs using advanced software to give the captain an enhanced understanding of the vessel and its surroundings. The data is transmitted reliably and securely to a Remote Operating Centre (ROC) from where the Captain controls the vessel. The Remote Operating Centre was designed to redefine the way in which vessels are controlled. Instead of copying existing wheelhouse design the ROC used input from experienced captains to place the different system components in the optimum place to give the master confidence and control. 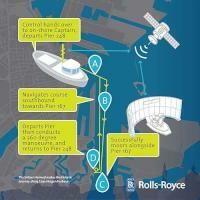 The aim is to create a future proof standard for the control of vessels remotely. Throughout the demonstration the vessel had a fully qualified captain and crew on board to ensure safe operation in the event of a system failure.